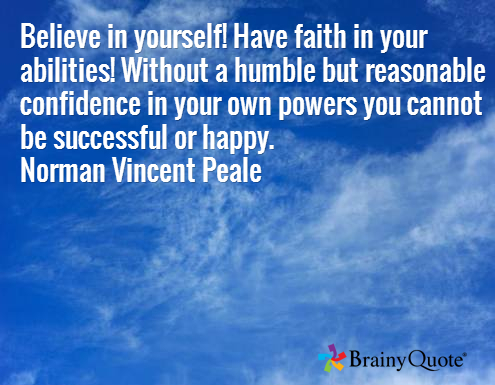 Norman Vincent Peale was an American clergyman living from 1898 to 1993. ‘Believe in yourself…’ I like this quote as it balances self-confidence with a reasonable dose of humility and modesty. Humility is about being in touch with reality. It’s also about relationships. People are alienated by excessive pride, arrogance, and pomposity. And this is how I came to this topic: Have you ever wondered why people often say ‘I feel humbled’ after receiving a form of recognition such as an award? Technically, feeling humbled means to be abased, brought down a notch, or defeated. In reality, if you received a prize, award, or prestigious review wouldn’t you feel honoured, grateful, or even proud? Your humility might make you feel undeserving, but the honour wouldn’t humble you. If you could accept the praise, you might feel honoured, grateful, and even proud. An interesting article in The Atlantic suggests that when receiving public recognition, people feel the need to assure others that they are not cocky or vain–for good reason–prideful posturing alienates others. However, as someone who takes a special interest in words, I wish people would feel empowered to express gratitude for an honour that others bestow on them, rather than suggesting that it is humbling. To read more quotes, please visit Writer’s Quote Wednesday & #BeWoW – A Month of Christmas Quotes – Laura Ingalls Wilder and Eddie Cantor – Slow down and enjoy life, the respective ‘headquarters’ for Writer’s Quote Wednesday and Be Writing on Wednesday. A very powerful thought you shared. Indeed I agree when ever I listen to such speeches where people talk about being humble and humility, Indeed feeling gratitude ,honoured should precede ,feeling humble. Humility can also be shown in their expressions, their gestures not only in words ! I like your point–we convey so much in nonverbal ways. Never thought of this this way but you’re right–we do we abase ourselves instead of just express gratitude? Do we think we don’t deserve it? Perhaps we’ve become so used to scorn that we just don’t know what to do with praise? I think somewhere along the way humility and coming across as humble has been confused with the words “I feel humbled “. I think that most people who say this are not actually feeling something ‘bad’. You could be right. recognition can be overwhelming and that can lead to feelings of unworthiness for the honor. Perhaps that is just humility. I do not know. It’s hard to generalize about how people feel because ultimately everyone has their own unique experience. My purpose in this piece was to draw attention to a possible disconnect between the language used and what people are feeling. I tend to accept the analysis offered in the Atlantic article that I referred to. Thanks for your conversation about this. It made me think more on the topic and brought me back to Peale’s advice that it is positive to have a ‘reasonable but humble confidence’ ie to feel deserving of some praise with a humble, moderate interpretation of its meaning. Me too in some areas… at least I like to think that I am a bit more confident than I was when I was younger. I definitely am more confident than when was I younger but I think I could be more confident. I think we could all be a little more confident in our skills. Imagine what we could do with a just a little more confidence? What would you do if you had a smidgen more? Good question. It’ll have to float–probably would have to do with putting myself out there in social situations–mentioning my blog etc–how about you? I’d get back out there and give dating another try. Maybe this time it’ll actually be fun. It wasn’t the last time. I’m 35 so every guy wants to know on the fist date if this it. I can’t tell after one date if this is someone who I’d want to be with forever. Nobody wants to take their time anymore. they’re all in a rush to check marriage off their to-do list. I can understand not being able to know after one date! Maybe you’ve already tried this? but –perhaps meeting guys as part of an activity such as a writing group, spiritual group or other activity where you get a better sense of them before even going out. I’d love to meet people that way. My job and my choir haven’t got any available men. So unless I want to commute 1+ hours into the city and back again (on top of working and commuting to my job and my other commitments), I’m stuck with online dating. I will eventually give that another go. I just wish there was a better way. You’re talking and thinking about it so perhaps some new ideas or opportunities will emerge. That’s my hope! 🙂 Thanks for your suggestions 🙂 and for the conversation. I’m glad you liked it. Since doing the post I ‘m realizing there are many nuances to the topic.